Cronos Criterion | Who Killed Orrin Grey? I’m planning on a post explaining kind of what I’ve been up to all year, since not even my wife can really keep it straight these days, but I’m waiting on something before I do it. So for now, I thought I’d talked real briefly about the new Criterion edition of Cronos. This is my first Criterion DVD, and I’m suitably impressed. 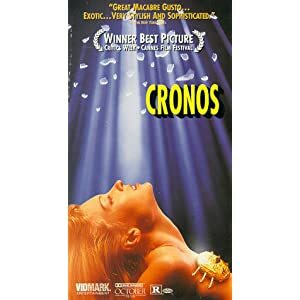 The first selling point is the fact that Cronos finally has appropriate cover art for the first time. 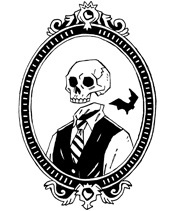 And not only do we get a great new Mike Mignola piece for the cover, but he also contributed a new image for the booklet insert and the disc art. So of course it looks great. If Criterion could be convinced to do a matching set of The Devil’s Backbone and Pan’s Labyrinth, I would be one happy camper. The commentary track with Guillermo del Toro is the same one that was on the previous DVD release of Cronos, which is still a great track, but that means that besides the packaging the big selling points here were the other special features. So far I’ve only watched a couple of them. “Geometria,” del Toro’s early short film, was… amusing. Which is all it was really intended to be. The Mario Bava lighting was good fun. The best thing, though, was the video tour of “Bleak House,” del Toro’s combo museum/production studio, which is maybe the most jealousy-inducing thing I have ever seen.